This is the third in our occasional series of blogs about the wonderful sponsors of the 9th Elysian Winter Beer Festival. The Drayman’s Son, 29 Fore Hill, Ely, Cambridgeshire CB7 4AA are generously sponsoring the bright orange T Shirts which will be worn by our team of volunteers supporting the festival and, for the first time, volunteers will be able to keep the T Shirts after the festival. Jo and Andy have been running the Drayman’s Son (named after Andy’s Father who worked as a Drayman in the local brewery) for 2.5 years and have made a great success of the business. Jo had worked in a pub before many years ago but this was the first time they had run a pub business themselves. The premises are nostalgically themed with memorabilia around the place including old signs and posters. There are plenty of board games to whilst away the hours when you have a drink there and if you are lucky you could visit on a quiz night or when there is live music on. You might even get roped into the dominoes team if you show too much interest! The Drayman’s Micropub which is an accredited member of the Micropub and Microbrewery Association, serves a wide selection of beers and ciders for every taste. I am keen on darker beers (porters, stouts and milds) and there is always a great selection each time I pop in, and different styles to try. The Drayman’s are also accredited by CAMRA LocAle which is a scheme to promote pubs that sell locally brewed real ale. The wide selection is demonstrated in the photos below – they also serve the Drayman’s best a beer exclusive to the Drayman’s produced by another of our sponsors, the Three Blind Mice Brewery. Alongside these are served local Ely Gins, English Whisky and Vodka, and an extensive range of soft drinks. The pub has been listed in CAMRA’s Good Beer Guide for 2 years running. If you want to have some food with your drink, the Drayman’s also offer great value for money Cheese Platters, Meat Platters, local Pork Pies, Sandwich Rolls and other snacks along with the widest selection of pickled eggs in the area. These are all very popular with the customers. Jo and Andy have certainly pursued a winning formula with the Drayman’s – this can be seen from the awards they have received. In 2016 and 2017 they swept the board winning the Ely and District CAMRA Cider pub of the year, City pub of the year and Overall pub of the year – this is a unique achievement. Alongside this, the Drayman’s were Cambridgeshire Cider pub of the year in 2017 and runner up in the East Anglia Cider Pub of the Year. Jo was also a finalist in the Local Hero Awards for the smiliest service – testament to the great welcome you will receive when you pay a visit. The Drayman’s does great work for local charities with over £10,000 having been raised. The nominated charities are Addenbrookes Hospital and Guide Dogs for the Blind, although numerous other charities have also been assisted. Money is raised via raffles and quizzes, stalls and the sale of knitted likenesses of some of the regular customers! Customers also help raise funds via sponsored events. Well behaved children and dogs are always welcome (children until 9pm). CAMRA members are entitled to a discount of 10p a pint and takeouts are available (2 to 4 pints). 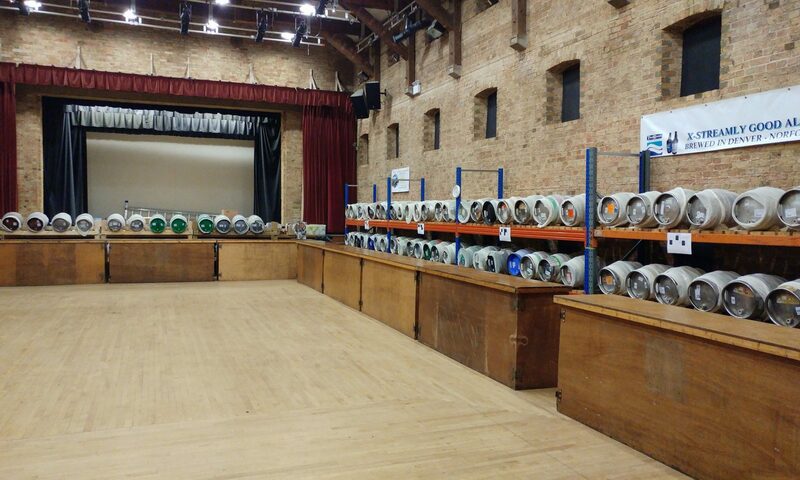 The Drayman’s son will also be participating in the Ely Fringe Festival over the weekend of the beer festival, so be sure to pay a visit and try some of the different beers which will be on offer there.